A Southern Grace: sigh. hello fall. Mmm, yummy! Anything with apples is a-o-k in my book. I'll have to try the Macoun--I am usually too captivated by the GingerGolds! Isn't it fascinating? You are sighing about fall, the coming winter, heavy clothes, snowy weather- your time to hole in. (I remember that feeling too.) We in Florida are just beginning to dig out from our loooong hot summer and into weather we love. Anyway Grace, I love your apple cake recipe. It sounds moist and delicious. Conforting to please and so delicious looking! I love apples in cakes! I love fall. I love apples. I love apple cake. This looks faboo! don't sigh about the seasons! and by the way, that picture looks too good. i could really use a snack right now. We are swarming in apples here in MA as well...I've been eating them daily and when I get a chance I will make a pie, or two. What an amazing looking moist cake! I bet the HoneyCrisp apple would be good in it. Do you get those? They're a cross between a Macoun and something else...maybe a Fiji? They have a short season and are pricey but they're the world's best apple, in my opinion! I think the only thing I like about fall, besides the new clothes are the apple cider doughnuts fried in hot grease! right? I mean come on. I love how moist your cake is, seriously. Unlike you I am whooping with joy, not sighing, so that cake looks especially tasty to me. Hello Fall!!!! There is not one sense of fall in the air here but then we don't have a fall or autumn here. I will though attempt to keep up with everyone's lovely fall inspired desserts. This lovely being the first. No sighing here - I am celebrating! Fall is my very favorite time of year, I can't wait to slow cook, roast and make soups. This apple cake looks and sounds perfect for fall - I love all the cinnamon. 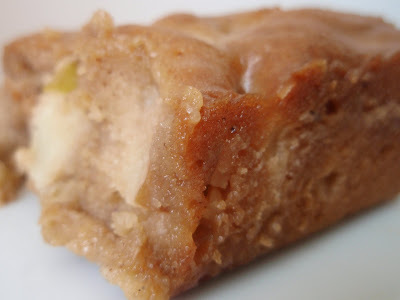 Apple Cake hugs sound like just the thing to coax me into fall. I can smell the brown sugar and cinnamon with that crisp note of apple already! I want some apple cake! We're having freakishly fall-like weather for Sept, and now I want apples, soup, and pumpkins. I'll take the corner piece, please. That, plus the brown sugar glaze, that's definitely a fall winner, something to look forward to! I dont' like cake, but I like this! What a way to start a new Fall! This is my kind of cake, simple ingredients with a twist; that wonderful brown sugar glaze. Great blog – glad I stumbled upon it! Well, what do you know. I might just have found the perfect apple recipe! I'm always welcoming to new apple recipes, but perhaps my search is over...this looks so simple, yet soooo comfortingly delish! With record high temps its feeling more like summer here than ever. However, that does not mean I cannot celebrate the beginning of fall for the rest of the country with some of this cake!! YUM YUM YUM< I have to make this and I know just what apple I will use, Honeycrisp! oooh, that sure does look delish! Oh, anything named apple cake cannot be bad. I've never head of that variety of apple but it looks like I may need to seek it out. The close-up of your apple cake make my mouth water. It looks so moist! This does look like a perfect fall dessert! Hi I am new to your blog and I live in the South...Oh how I would love some fall crip fresh cool air! I can't wait to make this even though we are seeing 80 degrees still most days! Gotta love fall for the wonderful apples and apple-related desserts! This looks lovely and very seasonal. Can't wait for the fall weather to arrive here, we are still having 100+ degree days. That said, as soon as it's cool enough to bake apple cake will be on the menu. Oh how I wish I could break out the long sleeve shirts! Send over some apple cake for my woes please!!! I'm just dying to make something with apples! There in the fridge sitting there waiting to be adorned in brown sugar and cinnamon (sigh). This cake looks wonderful! love Fall recipes..a scoop of vanilla ice cream and a slice of this apple cake please? This apple cake sounds just delightful! yum apple cake. i love fall and all of its warm tasty treats. I can't wait to see what other fall treats you have to come. Oh how I love apple season, and how I'd love a slice of this! I also love apple season & this recipe is delicious! Grace this looks like a nice and simple apple cake. We went apple picking last week and while picking I sampled all kinds of apples, by the time it was time to go my chin was full of hives. I must have an apple protein allergy too! Now that's what I call a good use of apples! I'm not a big fan of pie, I've been thinking of applesauce, but now I know what I'm gonna make. Great idea Grace, I love apple and pretty excited about trying so many recipes with it. Yep, I'd go for the corners! I need to try those apples. Right now I'm a fan of freshly picked Mass Mcintosh apples :). You've got me craving apple cake now! This looks fannnnntastic. I've never tried that apple, Grace, but I'm going to look for it at the store now. Grace, thanks for trying a cake from our blog! Apple cakes are one of the best things about fall. I agree about the prime real estate. Dibs on a corner piece. What a lovely apple cake and you're right, so perfect for fall! I don't know what will be better - how great this will make my house smell, or how amazing it'll taste. I can't wait to make it! I would die for a piece. Looks so good. Oh, the great smells of Fall. I have an apple tree in my yard and I put lots of them in the freezer. One bag of them is certainly going in a FRESH APPLE CAKE. So Good!!! I also sad summer is gone..... that season is just too short! First of all, your recipes and photos always make me drool!! We, here in CA, are not yet experiencing any signs of Fall. We're having our Indian Summer, record high temps at the beach, so I'm not doing any baking, but your cake looks amazing! And, I do remember living in Upstate NY! It snowed on my first Halloween there and didn't stop until Mother's Day!! 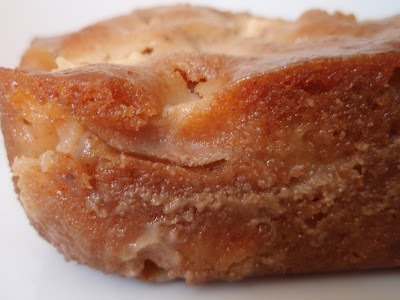 I've been thinking apple cake for about a week - these recipes have both been bookmarked! And I'm totally going to go check out Food Mayhem! Ooo yum! A great way to welcome fall. Interesting to know about the Macoun apple, though I've never heard of or seen it before. Grace this looks soooooo good, my mouth is watering, doesn't help I skipped breakfast this morning. I love that it is dairy free as well! This sounds and looks amazingly delicious. Topped with some ice cream, Id be in food heaven. Off to check out the apple dapple cake. Oh, you are a woman after my own heart!! I *adore* Macouns and wa devastated to find out they seldon find their way out of the states where they are grown, much less the country. Still, I've had 3 Fall visits to the US in recent years and always make sure I eat my fill of macouns... The cake looks sublime - must try it! Oh my.. apple cake is a must in the Fall! This looks yuumy. I love that it has three cups of chopped apples in it. Summer is gone but comfort food and some in season produce is at our disposal. You always make the moistest cakes, gotta be luv ya put into the dish, non? To be able to enjoy baked treats like this apple cake, I would gladly break out the long sleeved shirts and the space heater. This cake recipe looks awesome! oh my goodness! I just found your blog and I'm in love! your recipes (and blog layout too!) are so simple and yummy looking! I can't stop staring at this! Gorgeous photo and gorgeous apple cake! I think this apple cake is the perfect way to welcome fall! With open arms (and mouth)! this is a great way to welcome fall! Noiiiice! I really love that site too! And I'm so with you on the cake corners thing - a little crusty/crunchy, chewy, and extra glaze. Yum. Mmm, nummers! I too, would be hard pressed to turn down a piece of this cake. How lucky for you to live in apple country. Fall has indeed arrived here in Tennessee. I am not wearing flipflops for the first time in a while. Sighs. Apple cake sounds good right now for breakfast. Apple Sauce and Apples Sounds great to me! This Fall kinda snuck up on me so I will be making this really soon! I'd give anything for fall to officially arrive here in Texas but I'll absolutely be cooking up some apples until it does :) I love a good apple dessert and can't wait to try this one. comfort food, is what say I... here in montana where we went from summer to winter...3 inches of the white stuff!!! YES! seasonal fall foods are my very FAVORITE and now tha the leaves are turning I can't wait to fill the kitchen with spells of pumpkin, apple, and spice. Thanks for this, I now know what I'm making for the first fall carnival of the year. Comfort food and fall are the best! This is a lovely cake that I am going to put on my "must bake" list! I made this last night Grace and it is divine! Brought it into the office today and it has been popular, I think I have eaten the majority of it though. Yum! Wow! We just made this for a birthday lunch at the office, it is incredible! So moist and delicious, there isn't a single crumb left! Thankyou so much for sharing such a fantastic recipe!